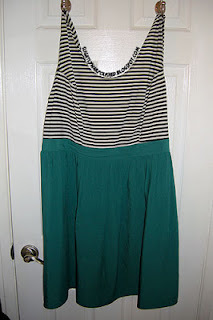 Today's post was inspired by a dress I got from Target. I love LOVE this tank dress. Everything about it I love: the color, design, fit, pattern... everything. 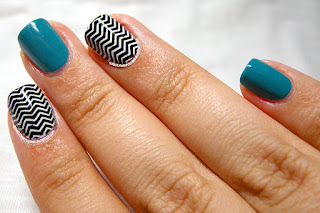 So, naturally, I was inspired to recreate it on my nails! The teal I used is Viridian Vinyl by Orly. 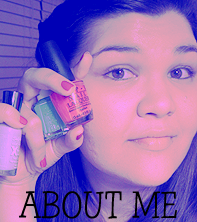 It's a matte polish so I used a generous amount of topcoat to get it extra shiny. 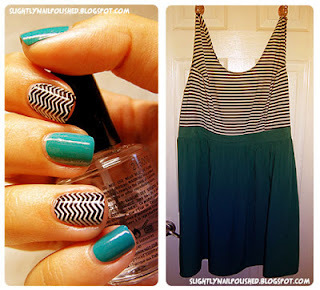 The color matched perfectly to the dress skirt, even though the pictures lead you to believe differently. Gah, stupid white balance. :( I have to work on a better lighting situation. I had a hard time deciding which stamp to use. "Should I do zig zag or straight lines?" I thought to myself. Yes, to me this is a very important and hard decision. 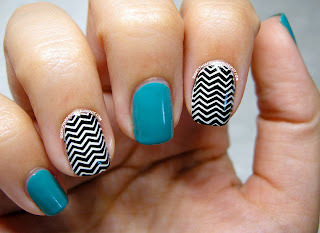 I thought that straight lines may be too boring so I opted for a more edgy zig zags. I used a simple white polish for the base and stamped with Konad Special Polish in Black. The stamp I used was BM-201 from Bundle Monster's 2011 Set. I had the hardest time cleaning the konad black from around my cuticles. Anyone else have this problem? Maybe it was because I recently did my cuticles, but that black sank into my skin and refused to budge. It wouldn't go away even when I scrubbed it with my detail cleaner brush and 100% acetone. GAH! I had to wait until they were completely dry and scrub my nails with soap under warm water to get them presentable to photograph. But, surprisingly, that seemed to work really well. :) I'll have to remember that trick for later. A better view of the dress. :) Like I said, I love it. I went back the next day and got another with grey stripes and a black skirt. It even has pockets. Do I need to say it again? POCKETS!!! If you want to check out the dress at Target's website, you can view it here. I highly recommend them if you're like me (a "full figured" girl) because light, airy, flattering dresses for spring/summer are hard to come by. And at a reasonable prices to boot, what else could you wish for? I hope you enjoyed this post and have a great week ahead. And Happy Cinco de Mayo! *Polishes and dress purchased by me. I am not associated with the companies mentioned above. Привет! Мне бы хотелось открыть салон парикмахерскую. У кого-то из читательниц есть опыт в этом? Очень большой выбор оборудования для салонов красоты. Кто может помочь советом? Какой магазин лучше выбрать для то чтобы купить Халаты для парикмахеров и это Парикмахерские принадлежности. Я выбираю среди этих магазинов Spashop.com.ua, Venko.com.ua, Newfacebeauty.pl, Ukrmedgarant.com.ua.